We’d like to introduce Michelle Knox, the creative DIYer and blogger for Ellery Designs. We spotted Michelle’s space on Instagram and we instantly fell in love her decor eye candy. Follow her on Instagram so you join the fun! Michelle recently moved into a new home and has been updating it with one DIY project at a time. On that list was her dated fireplace. Here is what it looked like before. Michelle thought it was blah and boring. 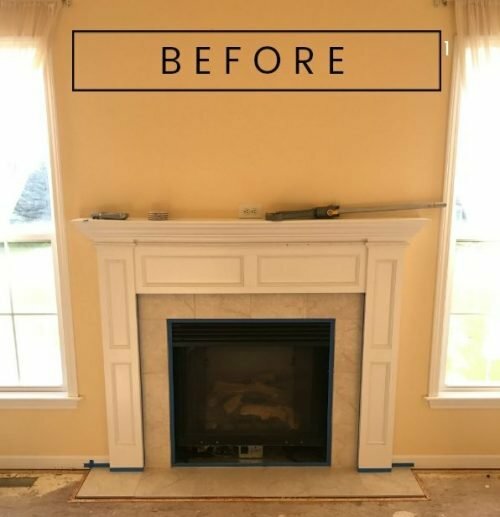 Replacing the hearth completely was not an option so Michelle decided to use paint and our stencils to give it a makeover. 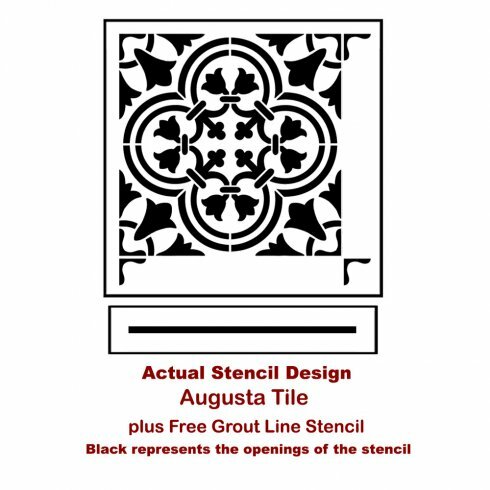 She browsed our amazing Tile Stencil Collection and selected our Augusta Tile Stencil. This super popular pattern was inspired by traditional Portuguese Azulejos tile designs. Our fans have used it on floors and walls because it can instantly add style to any space. 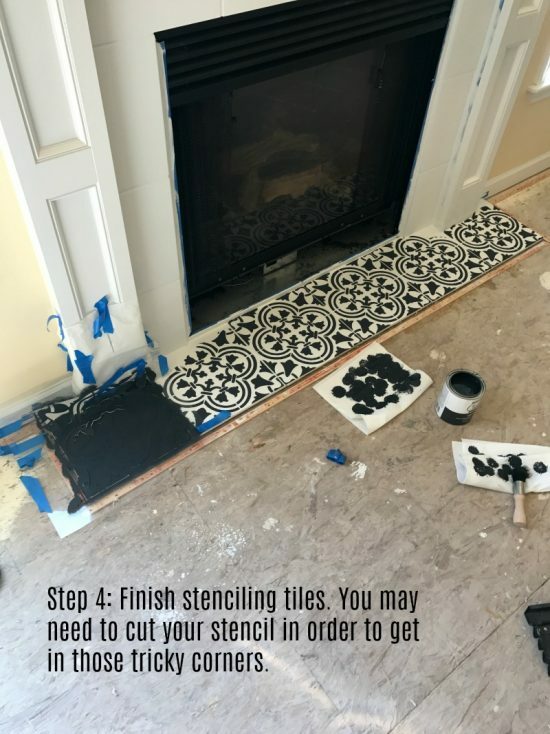 The first thing Michelle did was clean the hearth to ensure there wasn’t any debris and then she prepped and painted the tiles using Rust Oleum Chalk Paint in White Linen. Cleaning and prepping a hearth properly is very important for a project like this. With her stencil in hand, she was ready to start stenciling! 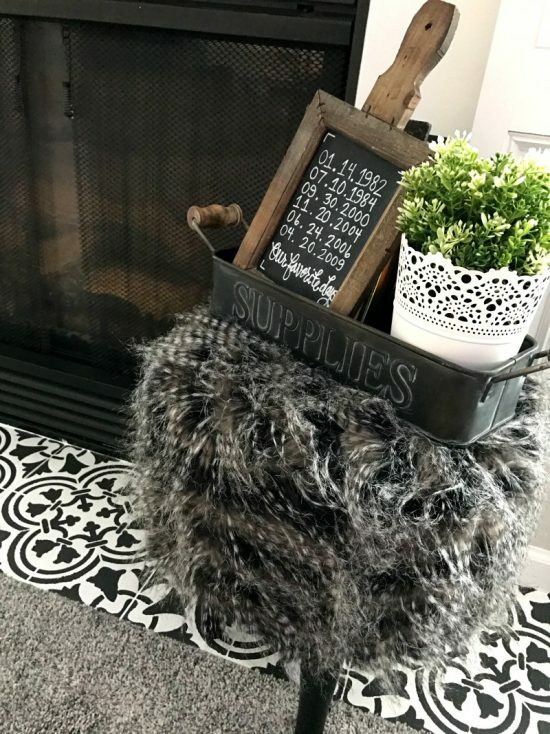 She used blue painters tape to hold the stencil in place and a stencil brush to paint the pattern in Rust Oleum Chalk Paint’s Charcoal. 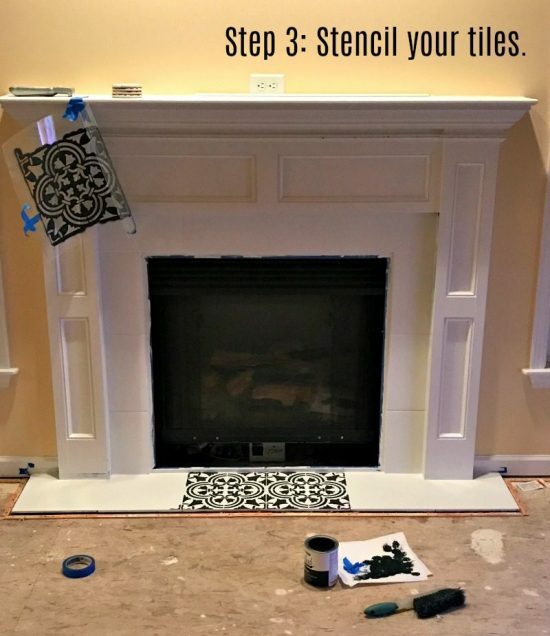 After each section was complete, Michelle would un-tape the stencil and reposition so she could paint the entire fireplace hearth. Once the space was stenciled, Michelle applied a clear matte top coat to increase durability. Are you ready to see how her project turned out? 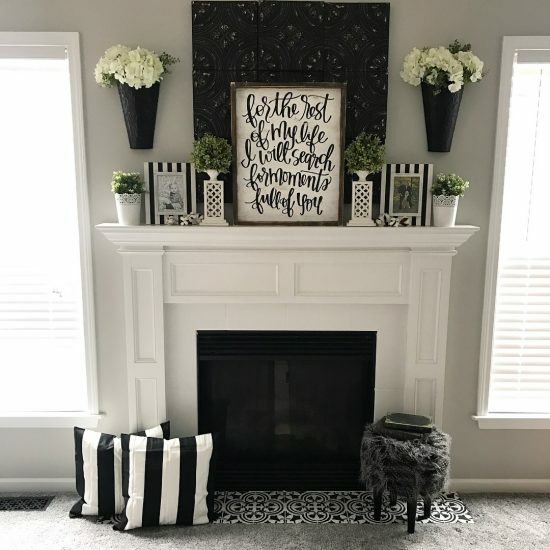 Here is Michelle’s newly stenciled fireplace! 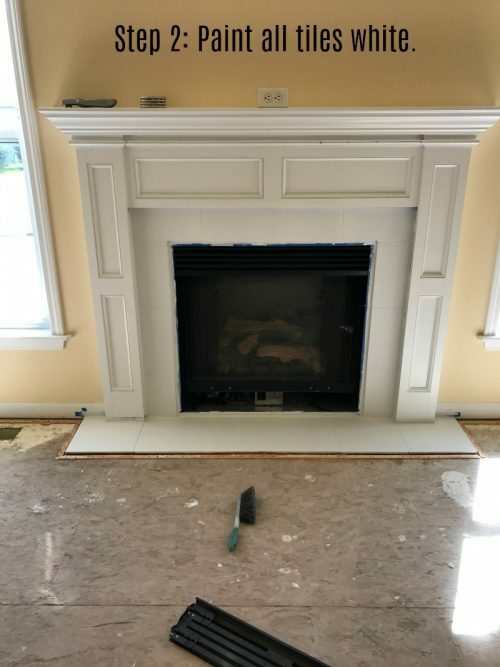 For more information about this project and to see more pictures of this stylish farmhouse fireplace makeover, please visit Ellery Designs. 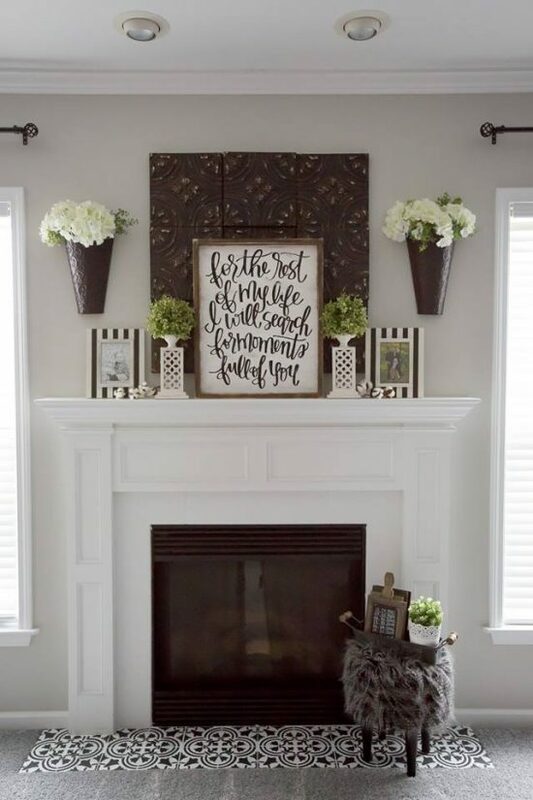 Tell us, do you have a fireplace that could use a stenciled makeover? We’d love to read your thoughts in the comments below. Have you completed a stencil project recently? Come share it on Facebook or Instagram using the #cuttingedgestencils. We love seeing our fans’ projects! Cutting Edge Stencils Presents New Holiday Stencils!